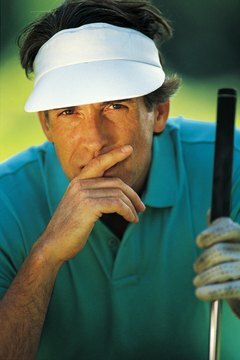 It is often said that the larger part of the game of golf lies between the golfer's ears. Mental strength is needed for successful performance in any sport. Your ability to focus and control thoughts is directly related to success on the course, and you can improve your mental game with positive thoughts and confidence. The brain controls body movement. Training and practice of any physical activity is actually conditioning the mind, shortening the process between thinking and acting. The actions become subconscious. For example, once you learn how to ride a bike or drive a car, it becomes a habit and you no longer have to concentrate on each movement. Because the brain tells the rest of the body what to do, what you think about on the golf course naturally impacts your game. Thinking about a bad shot or outcome has a negative effect on how the next shot will go. Example: You’re approaching a shot and notice the trees off to the right. You think, “I need to avoid those trees,” and you have just painted a picture in your mind of hitting into the trees. Conversely, if you visualize only where you want the ball to land, the brain signals to the body exactly what needs to happen to make that shot. Instructors teach pupils to imagine a straight line between the tee and the hole and aim the shot along that line. This simple exercise requires intense focus. In his 2004 instruction book "Golf My Way," Jack Nicklaus cited confidence and focus as two essential forms of mental conditioning. The more you practice focusing, the better your game. Stay “present.” Golf does not involve multitasking. Concentrate on what's happening now and let others speculate about the future and ramble on about the past. You should concentrate fully on each stroke. Keep your internal dialogue positive to ensure your brain is focused on the best possible outcome. Be optimistic about each shot no matter how unattractive the situation. Believe you can execute the shot and block any negative thoughts. Exuding confidence with each shot is evidence of a strong mental state. Golfers with high expectations show their competitive spirit, and their enthusiasm may influence the other players’ psychological state. Emotional control on the golf course includes briefly celebrating a successful shot and recovering quickly from a missed one. Some people thrive under pressure. They seek it out or even create situations to push themselves, but stress can also be difficult to recover from. A positive mental golf game balances good sportsmanship with appropriate emotional releases; acknowledge a wayward lob into a sand trap with a simple head shake and enjoy a successful putt with a fist pump. The mental aspect of golf is not separate from the rest of the game. You can have the most positive attitude in the world, but without a good grasp of the fundamentals, the right equipment and physical stamina, you will still play poorly. The key is to leverage the brain to achieve success while selecting the right club, perfecting your stance and swing and keeping your eye on the ball.